Domestic cats have learnt to stand tall on their hind legs because they have lived with humans for thousands of years. Of course, humans walk upright on two legs and are much taller. It appears that the domestic cat has copied the human’s upright stance finding that it helps to get noticed when he is taller. Is this leading somewhere? In 1000 years time, are we going to see our domestic cats walking around on two legs all the time, speaking English or French? 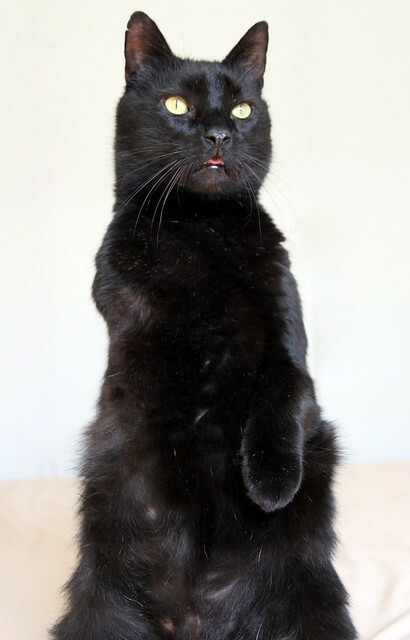 Dwarf cats, particularly Munchkins have a reputation for standing/sitting on their hind legs/bottom. This gives them the height they lack especially in the giant world of people. There are some extraordinary cats on hind legs pictures. They are all domestic cats. I don’t think I have seen a wild cat in the wild on its hind legs unless the cat is in that position for a fleeting moment and involved in some sort of activity. Domestic cats go up on their hind legs to (a) see better and (b) to become more impressive and intimidating and (c) to get noticed. This is another eye catching cat photo of a stunning and unusual looking Persian cat sitting on his hind legs. He looks like he is on castors ready to be wheeled around. The caption is, “Here is Moe (our 8 month old Persian) on his hind legs checking out something behind me.” For the record he looks like a traditional Persian cat as his face is not extreme (flat). His fur is amazing. Lots of maintenance though (from you I mean…!). I can’t resist the opportunity of reshowing Charlie in his classic meerkat position. Charlie has learnt to do this because he can. He has developed very strong lower back muscles because as he has three legs he has to use his back muscles to lift his body up to release his single front leg from ground and then lurch forward. When you feel his back muscles they are like iron. He slowly raises himself into this position and holds it for up to about 20 seconds. He is very handsome in this picture, don’t you think? Mind you, I am slightly biased. He likes to have his tongue out. I am not sure why. It is probably easier to breath or something like that. I can see this little ginger boy (girl?) at my local gym. He’d probably walk in on two legs and use the treadmill first 😉 This is his back stretching exercise. I hope you like these cats on hind legs pictures. Cats are amazing. But watch out. In a thousand years time the domestic cat will be our masters and we’ll be on all fours meowing for our daily milk. This entry was posted in Cat Anatomy, Cat Behavior, Cat photography, Pictures of Cats and tagged cat meerkat position, cat photography, cats on hind legs, pictures of cats by Michael Broad. Bookmark the permalink. What amazing pictures,I like the way Charlie is on a white background almost like a cut out, he’s a very handsome boy, cats are so clever and flexible they can do anything they desire, even take over the world. I love the pictures, especially Charlie of course, he is such a handsome boy. I asked our Walter and Jozef one day what they thought about humans walking on two legs and they actually said it was probably invented so that people stood taller than animals because most people think they are a higher species. They added that it was OK for cats to do this occasionally but how stupid humans are to put all their weight on two legs and feet rather than four. Hmmm just who IS the most intelligent species? Yes, cats shouldn’t try and copy humans. No point as four legs are better than two as you say. All domestic cats have the potential to sit on their hind legs and that includes the Singapura. It depends on the personality of the cat. Most cats won’t do it.